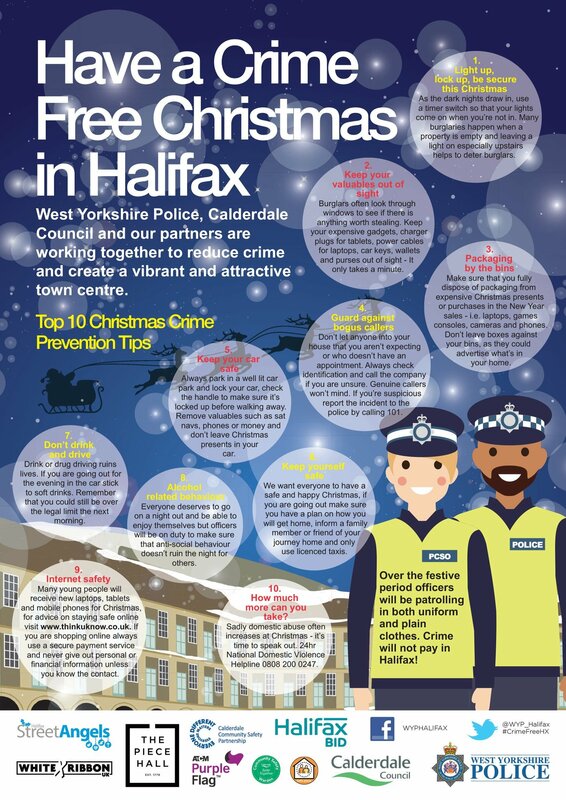 West Yorkshire Police and Calderdale Council are working together to reduce crime over the Christmas period with 10 tips for crime prevention. Light up, lock up and be secure. Dispose of packaging carefully. Boxes can advertise what is in your home. Keep your car safe in a well lit area. Keep yourself safe – plan how you will get home after a night out. Enjoy a drink but don’t go over the top. Stay safe on the Internet, especially if your children receive new tablets etc. Tips on staying safe can be found at www.thinkuknow.co.uk. Know the Domestic Violence helpline 0800 200 0247. Advice on Home Security can be downloaded from Home Security Advice. ← North and East Halifax Friday Flyer 21 December – OUT NOW!